If you’ve had the privilege of vacationing in Hawaii, you might already be scheming about how you can return with the right combination of miles, points, and time off work. And if you’ve never been, it’s not to be missed – and you can use your Chase Ultimate Rewards to get to Hawaii for nearly FREE! Chase Ultimate Rewards cards are also the first we recommend for folks new to miles and points. Massive sign-up bonuses like the current offer of 80,000 Chase Ultimate Rewards points (worth at least $1,000 in travel) after spending $5,000 on purchases in the first 3 months of opening the Chase Ink Business Preferred can put your Hawaii vacation dreams well within reach. I’ll show you my favorite ways redeem Chase Ultimate Rewards points to Hawaii – one of my favorite destinations – and create an incredible travel experience at a fraction of the cost! Hawaii is a bucket-list spot for many because it offers island luxury, amazing culture, and natural beauty not found anywhere else in the US. And it can be very expensive. 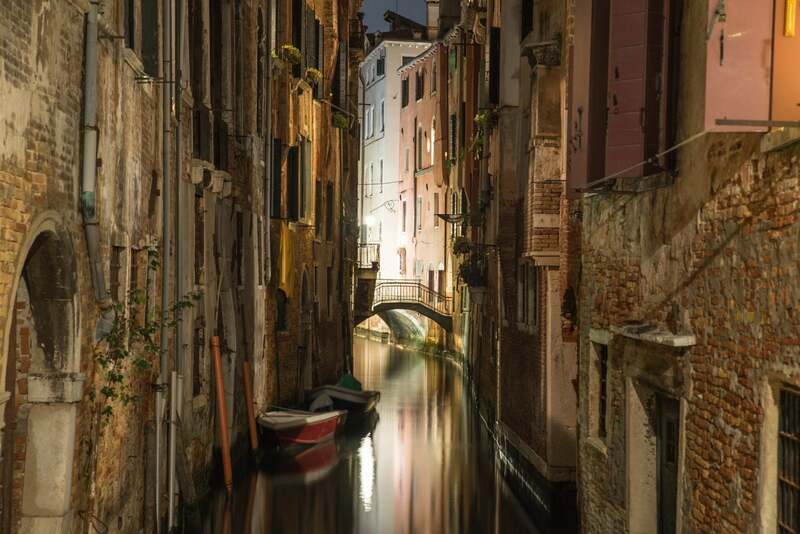 The good news is, you don’t have to spend a fortune or save for years to visit. With the right travel credit cards and airline transfer partners, you can redeem miles and points to get there for pennies on the dollar. Chase Ultimate Rewards points give you lots of options for booking flights to the Aloha State. But determining which islands you should visit takes some planning. I’ve only ever been to Oahu and Maui, but I can’t wait to plan additional trips to the more romantic Kauai as well as to explore the vast nature of the Big Island. On our last trip to Maui, we took an incredible helicopter tour of the sea cliffs of Molokai as well as western Maui. It was truly an unforgettable experience – and now one that I want to share with other members of my family. Oahu is packed with hot spots (such as the famed Waikiki beach), interesting American history (Pearl Harbor), and endless tourist attractions like Hanauma Bay and Diamond Head. 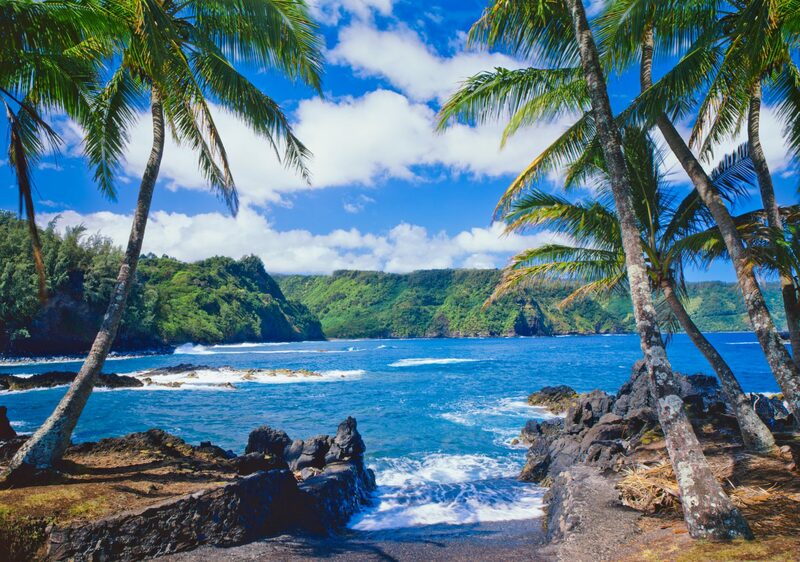 For a quieter experience, the Big Island offers volcanic adventures and rugged charm, while Kauai is widely regarded as one of the most romantic destinations in the US. Whichever of the islands you choose, you’ll be met with island hospitality and incredible vistas far as the eye can see. If you plan to venture underwater, you’ll uncover even more natural wonders with coral, fish, and sea turtles galore! So if you’ve never been to Hawaii or you’re hoping to return – get planning! My favorite way to redeem Chase Ultimate Rewards points for flights to Hawaii is by transferring them to British Airways Avios points. If you live on the West Coast, you’ll pay just 25,000 points round-trip for coach flights to Hawaii. British Airways has a distance-based award chart, and flights under 3,000 miles in distance cost just 12,500 British Airways Avios points one-way. British Airways is partnered with American Airlines and Alaska Airlines, so you have lots of options when considering which routes to fly. 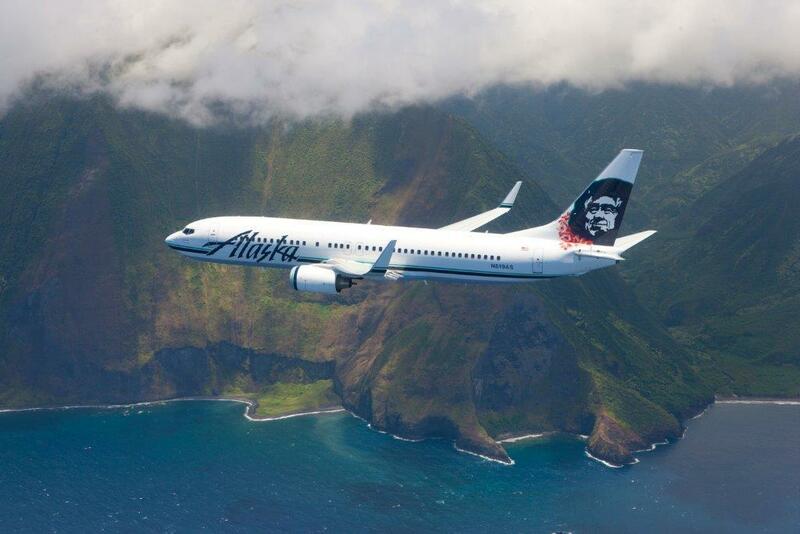 For example, Alaska Airlines has over 25 daily flights from the West Coast to various Hawaiian islands—meaning you have lots of options when looking for award flights! As with most other award flight bookings, you’ll find the most available award seats when planning far in advance. So I recommend you start looking for flights as soon as you know the dates you’ll be traveling. 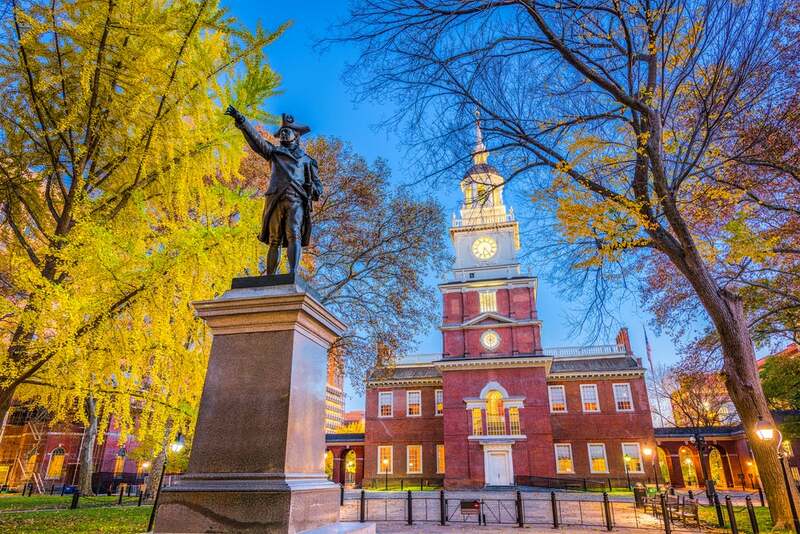 For award flights on American Airlines, you can search and book directly on BritishAirways.com – but for Alaska Airlines you’ll have to find low-level award seats on the Alaska Airlines or American Airlines websites, then call British Airways to book. Just last year, my wife and I flew from Portland to Maui on Alaska Airlines. The flight was quick and comfortable, and I highly recommend booking with British Airways Avios points if you can find award seats. United Airlines is probably my favorite Chase Ultimate Rewards airline transfer partner, because it’s easy to search for and book award flights on United.com. United Airlines also has a partnership with Hawaiian Airlines, so it’s easy to combine inter-island flights with your primary flight from the continental US. This makes for a great use of the United Excursionist Perk! 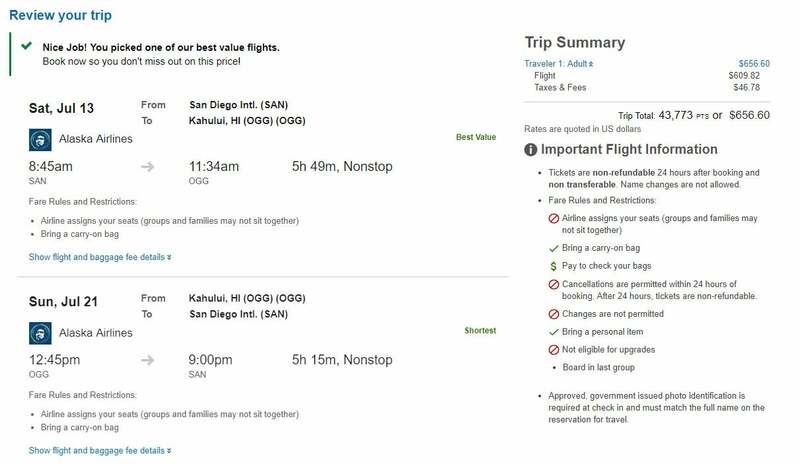 If you can find low-level award seats, United Airlines’ award prices to Hawaii starts at 22,500 United Airlines miles one-way in coach. Flights in Business Class price out at 40,000 United Airlines miles per person, one-way, but these can be notoriously difficult to find. In fact, if you do find United Airlines award flights at the cheapest prices (22,500 miles in coach or starting at 40,000 miles in Business Class), I recommend you do NOT book your award flights with United Airlines miles. That’s because Singapore Airlines, another transfer partner of Chase Ultimate Rewards, will sell you the same flights for fewer miles! Singapore Airlines only charges 17,500 miles one-way, per person in coach. Or you can pay just 30,000 miles per person, each way to fly in Business Class. That’s a significant savings when compared to what you’d pay if booking with United Airlines miles! On the other hand, I sometimes book flights to Hawaii with United Airlines miles when low-level award flights are not available, because United Airlines releases additional flights at a premium. For example, United Airlines offers several levels of coach that might range in price from 22,500 miles to 45,000 miles one-way. Although you may pay more miles, they can be useful if you are less flexible with your travel dates (such as due to school holidays or weekend constraints) and need flights on a particular day. While British Airways Avios points are by far the most valuable for award flights on Alaska Airlines and American Airlines, the Flying Blue (Air France / KLM) loyalty program offers great value for award flights on Delta to the Hawaiian Islands. Delta offers flights to 4 Hawaiian airports, and offers convenient connection points regardless of where your journey begins in the US. If you can find low-level award seats, coach flights on Delta from the continental US to Hawaii begin at just 15,000 Flying Blue miles per person, one-way in coach. Or you can pay twice that (starting at 30,000 miles per person, each way) to fly Business Class and enjoy more space as well as on-board drinks and meals. However, you might already be thinking about how difficult it can be to find low-level Delta award flights. You would be correct—especially if trying to book last minute, or if you’re particular about the dates or exact flights you want to take. 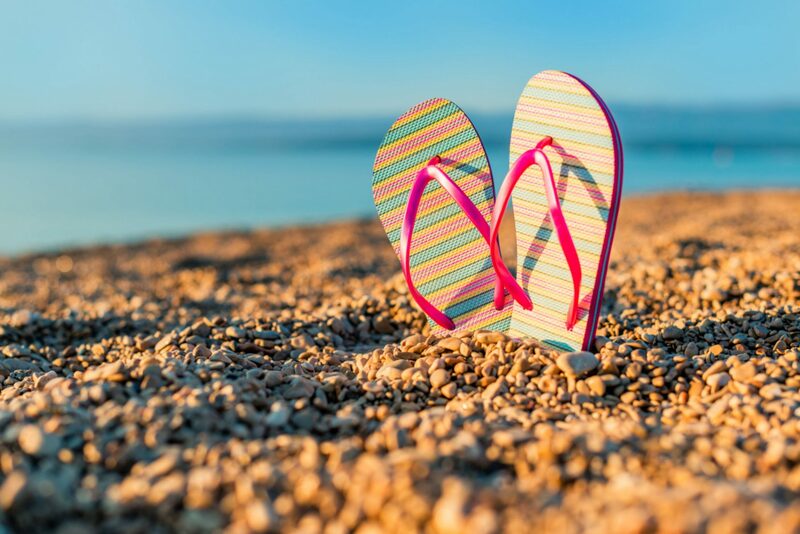 You Can Redeem Flying Blue Miles for Delta Award Flights to Hawaii – Don’t Forget Your Flip Flops! If you have some flexibility, or if you know your Hawaiian vacation plans well in advance, you might luck out with finding the right award flights at the perfect time! I always recommend that you search for award flights as soon as you know about the dates to get the flights that work best with your schedule. Keep in mind that Delta offers tons of award flights to Honolulu, including non-stop flights daily from Minneapolis and Atlanta. So Delta is another great option if you’re based in the Central or Eastern US. If you’re struggling to find the award flights you want, consider paying for your flights with Ultimate Rewards points through the Chase Travel Portal. 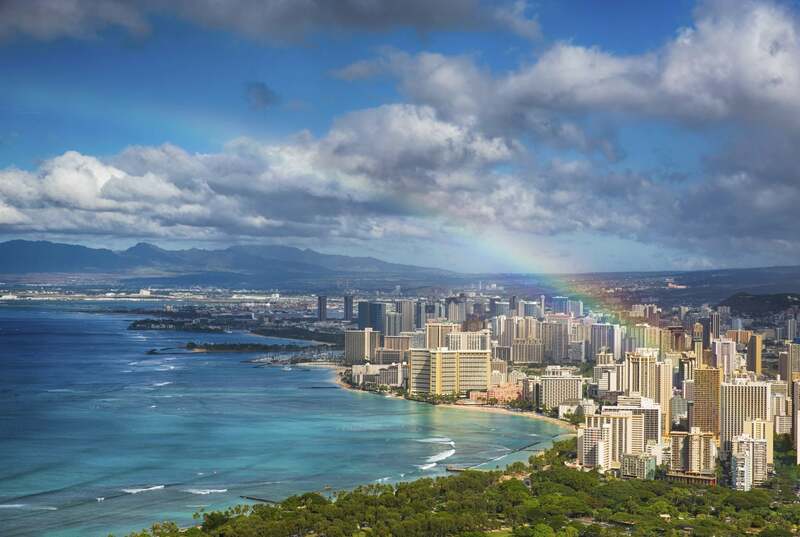 With flights to Hawaii costing less than ever before, if you find a good sale you can pick the precise flights that work for your schedule or your family’s needs and still save on points. Remember that your Chase Ultimate Rewards points are worth different amounts based on which Chase credit cards you hold. If you hold the Chase Sapphire Reserve, your Chase Ultimate Rewards points are worth 1.5 cents each when redeeming through the Chase Travel Portal. But with the Chase Ink Business Preferred or Chase Sapphire Preferred, your points are worth 1.25 cents each when booking through the portal. With any other Chase Ultimate Rewards card, your points are worth 1 cent apiece. So if you would prefer to earn miles for your flights, be more particular about your travel dates and times, and don’t mind spending a bit extra, I would recommend you book your flights through the Chase Travel portal. Once again, try to buy your flights as early as possible or when there’s a fare sale to get the best deals! Southwest still hasn’t released details for their Hawaii flights, but they’re supposed to be coming very soon. 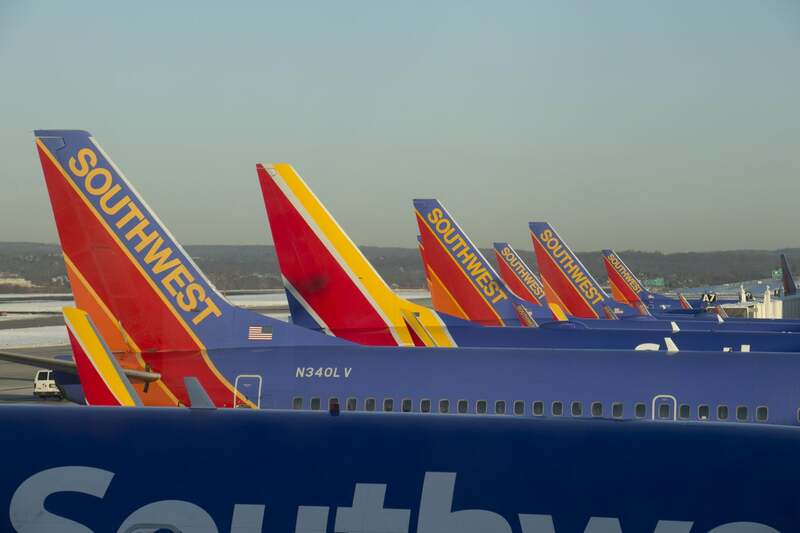 These tickets will likely be priced very competitively, and you’ll be able to redeem Southwest points to cover the cost of your flights. Folks with the Southwest Companion Pass stand to get HUGE value if they want to bring along a friend on their next Hawaiian adventure. So even though these flights aren’t yet open for booking, it’s a great option to keep in mind for future reference! No matter where in Hawaii you want to visit or which airline you prefer to fly, the flexibility of Chase Ultimate Rewards points can help you make your Hawaiian vacation a reality. Even a single sign-up bonus from a credit card like the Chase Ink Business Preferred (currently 80,000 Chase Ultimate Rewards points after meeting minimum spending requirements) can help you cover 2 round-trip flights to Hawaii from the continental US. In the past, I’ve easily found non-stop award flights from West Coast cities to the Hawaiian islands of my choice, but it certainly helps to book far in advance. 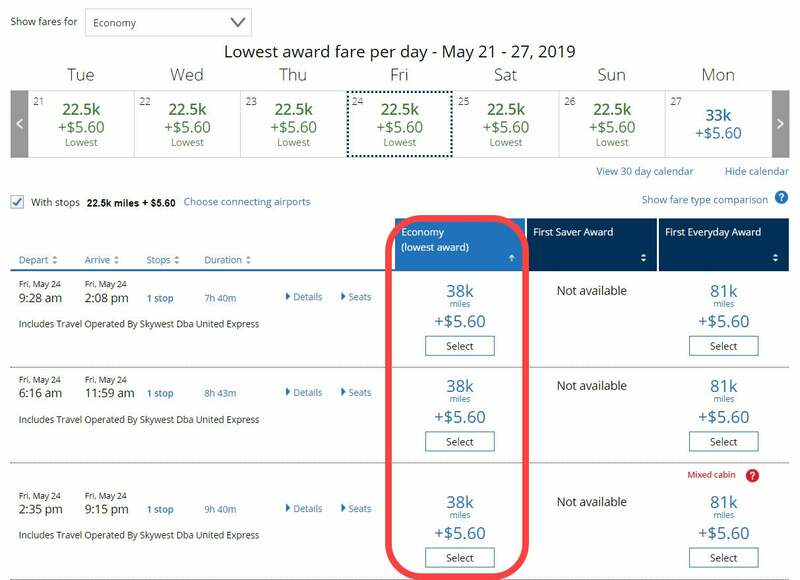 And knowing that the cheapest way to book award flights on United Airlines sometimes isn’t with United Airlines miles can save you a significant amount of Ultimate Rewards points! 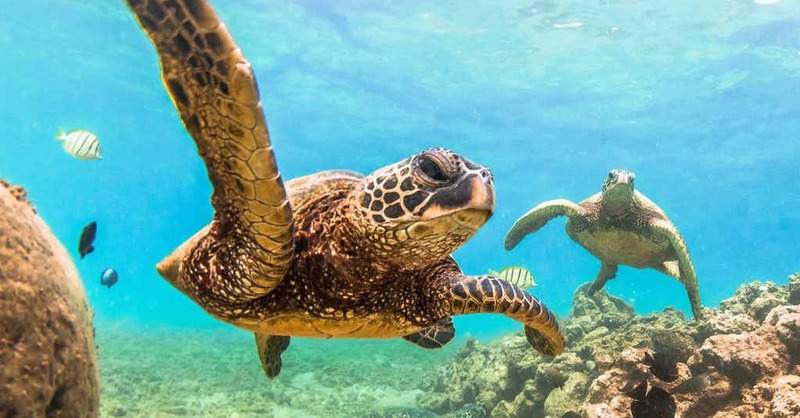 You’ll have plenty of adventuring to do once you arrive in Hawaii, like the Road to Hana, helicopter tours, surfing lessons, swimming with sea turtles, ziplining, and more! So I hope you can use some of the strategies and tips above to make flights to Hawaii as cheap (or free!) as possible. What’s your favorite way to get to Hawaii with Chase Ultimate Rewards points? Wife and I have been trying to find/plan the best way to get to Hawaii, 1st class, from the East coast. Confused on if there are non stops from BOS? Do we go coach from East to West, then 1st from West to Hawaii? If we only had enough for 1 leg, I’d delay the gratification and get the flight back from West to East…something to look forward too, any thoughts?